نظام‌های بهره‌برداری خانوادگی، یکی از رایج‌ترین نظام‌های بهره‌برداری از زمین در استان کرمانشاه است. بررسی‌ها نشان می‌دهد پژوهش‌های اندکی در رابطه با سنجش آسیب‌پذیری این نظام در استان کرمانشاه صورت گرفته است، درحالی‌که سنجش آسیب‌پذیری می‌تواند راهنمای خوبی برای برنامه‌ر‌یزان و سیاستمدارن در تدوین برنامه‌ها، تخصیص منابع در سطح‌های مختلف و افزایش آگاهی‌های عمومی از ریسک‌ها باشد. ازاین‌رو، در پژوهش حاضر سعی شده با استفاده از روش توصیفی- پیمایشی و فرمول فلدبروگ و وون برون به سنجش آسیب‌پذیری نظام بهره‌برداری خانوادگی در بُعدهای اقتصادی، اجتماعی و محیطی پرداخته شود. جامعة آماری پژوهش کشاورزان گندم‌کار استان کرمانشاه بودند که برای انتخاب آن‌ها از روش نمونه‌گیری سه مرحله‌ای بهره گرفته شد (247n=). سنجش متغیرهای پژوهش در قالب طیف پنج‌قسمتی لیکرت نشان داد، میانگین توانایی مقابلة مشارکت‌کنندگان در پژوهش، بسیار کمتر از میانگین رویارویی آن‌ها با مشکلات اقتصادی، اجتماعی و محیطی مطرح‌شده است. علاوه بر این، نتیجه‌های محاسبه‌های آسیب‌پذیری با استفاده از فرمول فلدبروگ و وون‌برون نشان داد، نظام‌های بهره‌برداری خانوادگی به ترتیب دارای بیشترین سطح آسیب‌پذیری در بعدهای محیطی (میانگین 25/3)، اقتصادی (میانگین20/3) و اجتماعی (میانگین 11/3) است. Family farming system is the most important agrarian system in Kermanshah province. The review shows that few studies have focused on vulnerability in Kermanshah's family farming system; while assessments of vulnerability can provide an important guide to programmers and decision makers on resource allocation at various levels, and it can improve public awareness of risks. So, the main purpose of this paper is to assess economic, social, and environmental vulnerability by Fledbrugge & Von Braun formula. Wheat farmers in Kermanshah province were the target population for this study. Using a three-stage sampling, 247 wheat farmers were selected. A five point Likert scaling showed that coping of farmers are less than their hazard perception in the farming, Also more investigation revealed that family farming system have more vulnerability in the environmental (mean of 3.25), economic (mean of 3.20) & social (mean of 3.11) aspects. وزارت جهاد کشاورزی، معاونت برنامه‌ریزی و اقتصادی، مرکز فناوری اطلاعات و ارتباطات، (1390)،آمارنامة کشاورزی. خزانه‌داری ل.، زابل عباسی ف.، قندهاری ش.، کوهی م. و ملبوسی ش، (1388)، «دورنمایی از وضعیت خشک‌سالی ایران طی سی سال آینده»، جغرافیا و توسعة ناحیه‌ای. خوش‌اخلاق ف.، غریبی الف. و شفیعی ذ، (1390)، «نگرشی بر تغییرات حداقل­های مطلق دما در پهنة ایران‌زمین»، جغرافیا و برنامه‌ریزی محیطی. دانشور کاخکی م.، کرباسی ع. و افسرپناه ا، (1379)، «بررسی وضعیت نظام­های بهره­برداری در زمین­های کشاورزی آستان قدس رضوی»، اقتصاد کشاورزی و توسعه. شرفی ل. و زرافشانی ک، (1389)، «سنجش آسیب­پذیری اقتصادی و اجتماعی کشاورزان در برابر خشک‌سالی (مطالعه موردی: گندم‌کاران شهرستان‌های کرمانشاه، صحنه و روانسر)»، پژوهش­های روستایی. Acosta-Michlik L. and Espaldon V. (2008) .Assessing vulnerability of selected farming communities in the philippines based on a bahavioural model of agentss adaptation to global environmental change. Global Environmental Change. 18: 554-563. Alam M. M. D., Siwar C. h., Jaafar A. H., Talib B. and Salleh K. h. (2013). Agricultural vulnerability and adaptation to climatic changes in Malaysia: review on paddy sector. Current World Environment. 8: 1-12. Bartlett J. E., kotrlik J. W. and Higgins C. h. C. (2001). Organizational research: determining appropriate sample size in survey research. Information Technology, Learning, and Performance Journal. 19: 43-50. Brenkert A. L. and Malone E. L. (2005). Modeling vulnerability and resilience to climate change: a case study of india and indian state. Climate change. 72: 57-102. Chirwa E. and Dorward A. (2009). Agricultural input subcidies: recent Malawi experience. Published by Oxford University press. 320p. Deressa T., Hasan R. M. and Ringler C. (2008). Measuring Ethiopian farmers’s vulnerability to climate change across regional states. International Food Policy Research Institute 25p. Eakin H. (2003). The social vulnerability of irrigated vegetable farming households in central Puebla. environmental and development. 12: 414-429. Erda L. (1996). Agricultural vulnerability and adaptation to global warming in china. Water, air, and soil pollution. 92: 63-73. Feldbrügge T. and von Braun J. (2002). Is the world becoming a more risky place?. trends in disasters and vulnerability to them. 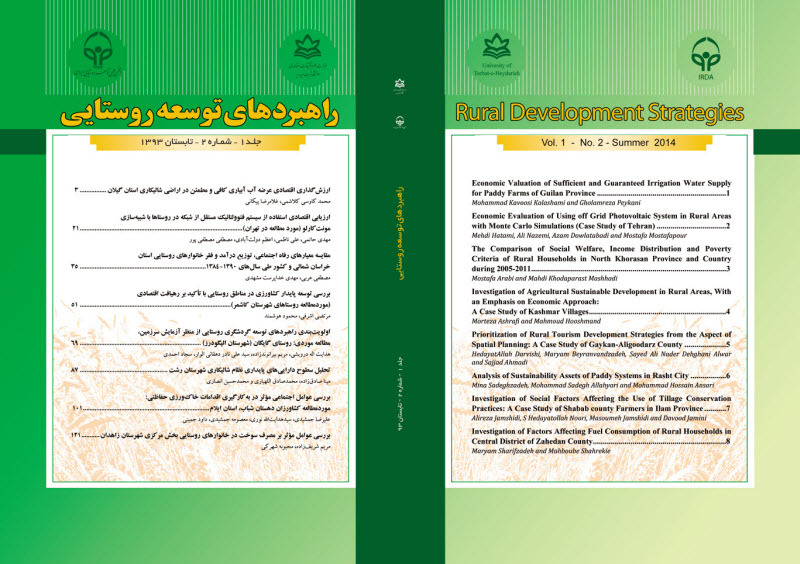 ZEF Discussion Papers On Development Policy No. 46, Center for Development Research, Bonn. 48p. Harris J. M. (2010). Agricultural income and finance outlook. DIANE Publishing. 73p. Harvey C. A., Rakotobe Z., Rao N. S., Dave R., Razafimahatratra H., Rabarijohn H. and Mackinnon J. K. (2014). Extreme vulnerability of smallholder farmers to agricultural risks and climate change in madagascar. Philosophical Transactions B. 369: 1-12. IPCC. (2007). Climate Change. Cambridge university press. cambridge, UK. Jamir C. h., Sharma N., Sengupta A. and Ravindranath N. H. (2013). Farmers’ vulnerability to climate variability in dimapur district of nagaland, India. Regional Environmental Change. 13: 153–164. Klemick H. (2007). The economics of fallow: evidence from the eastern amazon. Published by ProQuest. 159p. Lindel M. K. (2013). Disaster studies. Current Sociology Review. 61: 797-825. Luers A. L. (2005). The surface of vulnerability: an analytical framework for examming environmental change. Global Environmental Change. 15: 214- 223. Miller Ch. E. (2010). Say a tales. Published by Xilibris corporation. 232p. Peshin R. and Dhawan A. K. (2009). Integrated pest management: dissemonation and impact. Published by Springer science and bussiness media. 468p. Prokopy L. S., Mase A. S. and Pretty-hill R. (2013). Assessing vulnerabilities and adaptation appraoches: useful to usable tools. Climate vulnerability. 2: 129-137. Ribot J. C, Magahalaes A. R and Panagides S. (2005). Climate varability, climate change and social vulnerability in the semi-arid tropics. Publishing by Cambridge University press. 192p. Storeng K. T., Drabo S. and Filippi V. (2013). Too poo to live? A case study of vulnerability and maternal mortality in Burkina Faso. Global health promotion. 20: 33-38. Tao S. h., Xu Y., Liu K., Pan J. and Gou S. h. (2011). Research progress in agricultural vulnerability to climate change. Advances in climate change research. 2: 203-210. Van der Geest K. and Dietz T. (2004). A literature survey about risk and vulnerability in drylands, with a focus on the Sahel. The impact of climate change on dry lands: with a focus on West –Africa. Kluwer academic publisher. Printed of netherland. 117-146. Wall E., Smit B. and Wandel J. (2011). Farming in a changing climate: agricultural adaptation in canada. Published by UBC press. 288p. Wang X. D., Zhang X. H., Liu S. Z., Liu J. G., Wang Z. Y. and Li M. H. (2008). Regional assessmant of environmental vulnerability in the Plateau: development and application of a new method. Aid Environments. 72: 1929-1939. Wisner B. (2004). Assessment of capability and vulnerability. (Eds. ), Bankoff G., Frerks G. and Hilhorst D. (2004). Mapping vulnerability: disasters, development and people. Earth scan, UK. Woods M. (2012). Rural geography III: rural futures and the future of rural geography. Progress in Human Geography. 36 (1): 125-134.